For other uses, see Bunko (disambiguation). In Japan, bunkobon (文庫本) are small-format paperback books, designed to be affordable and space saving. The great majority of bunkobon are A6 (105×148mm or 4.1"×5.8") in size. They are sometimes illustrated and (like other Japanese paperbacks) usually have a dust wrapper over a plain cover. They are used for similar purposes as Western mass market paperbacks: generally for cheaper editions of books which have already been published as hardbacks. However, they are typically printed on durable paper and durably bound, and some works are initially published in bunkobon format. 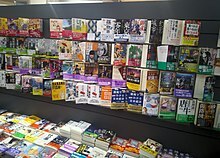 Tankōbon – Many manga are reprinted in bunkoban (or "bunko edition") format. Reclam – German publishing house. Their "universal library" (Universal-Bibliothek) series was a model for Iwanami Bunko started in 1927. This page was last edited on 1 April 2019, at 12:06 (UTC).